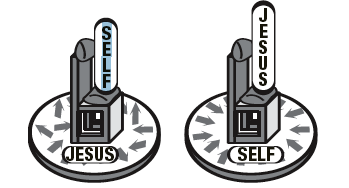 The circles below represent two types of Christians and the thrones represent who is in control. The circle on the left depicts a Christian who has given his/her life to Christ, but has chosen to rule his/her own life. All activities, interests, desires, and choices are self-directed, leading to a life of frustration and defeat (represented by the arrows). Galatians 5:19-21 describes the Christian who has self at the center of his life. “…I plead with you to give your bodies to God…When you think of what He has done for you, is that too much to ask?” (Romans 12:1). It is God’s great love for you that should be your motivation to trust the Holy Spirit completely with your life (2 Corinthians 5:14-15). “For three years I had been consumed with the desire to join the elite club for ‘cool’ guys in my high school…the ‘Mavericks’. Before coming to Christ, I would have ‘sold my soul’ to have been asked to join. Although I was a Christian, I thought it would still be okay…even though it was a drinking club. “I begin to seriously think about going all out for Christ, and putting aside things that were self-destructive. Finally I decided to make a decision by the end of the week.